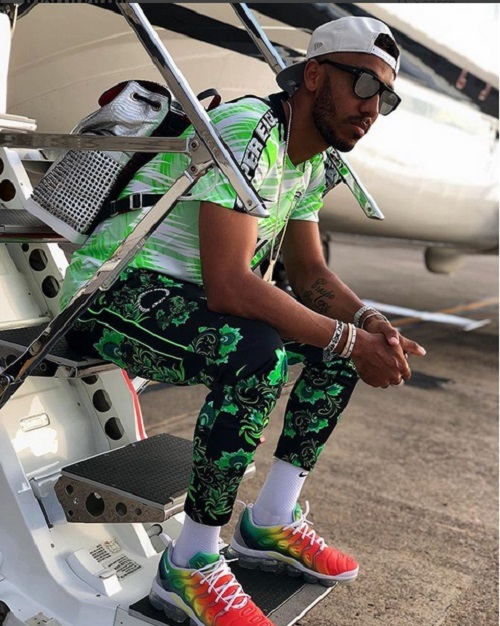 Arsenal striker, Pierre Emerick Aubameyang has shown his support for the Super Eagles after rocking Nigeria's jersey while posing for photos. Arsenal star Pierre Emerick Aubameyang who has openly stated that he is suporting the Super Eagles at the 2018 FIFA World Cup has been spotted rocking the new jersey. The former Borussia Dortmund star appreciated Nike for giving him the colorful jersey ahead of Super Eagles’ match against Croatia on Saturday. In a message on his official Twitter handle Aubameyang revealed he will be supporting the Super Eagles at the tournament. He added two reasons for supporting the Eagles, first, he said for his teammate Iwobi and the other for the amazing kits.